We thus expect tropical cyclone intensities to increase with warming, both on average and at the high end of the scale, so that the strongest future storms will exceed the strength of any in the past. Fig. 2 Percentage increase 1980 to 2016 (as a linear trend) in the number of tropical storms worldwide depending on their strength. Only 95% significant trends are shown. The strongest storms are also increasing the most. Red colors show the hurricane category on the Saffir-Simpson scale. 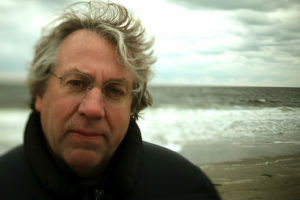 Graph by Kerry Emanuel, MIT. Creative Commons License CC BY-SA 3.0. 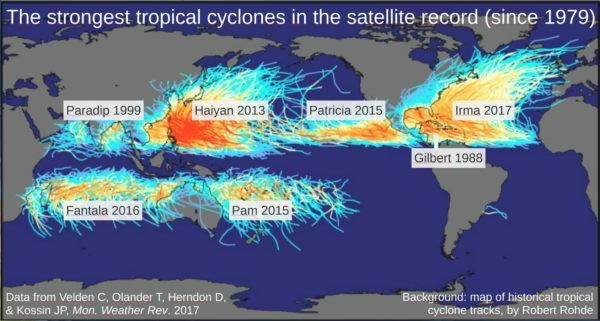 Update: A week after this post was published, Nature published Jim Kossins paper A global slowdown of tropical-cyclone translation speed. His analysis of the Best Track data shows just what the title says. Tropical storms are moving more slowly. That is bad news for the amounts of rain water they dump on a particular region – a prime examply was Hurricane Harvey last year. Velden C, Olander T, Herndon D, & Kossin JP (2017) Reprocessing the Most Intense Historical Tropical Cyclones in the Satellite Era Using the Advanced Dvorak Technique. Mon. Weather Rev. 145(3):971-983. Thanks for the clarification, Stefan! That’s very helpful. 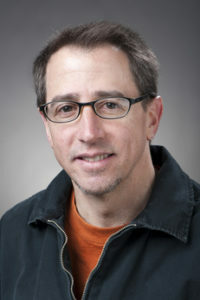 Wonder where Dr. Maue hides the TC graph on his site? At the risk of embarrassing myself again, I’m not finding it, starting at the ‘hurricanes’ graph. Thanks Al Bundy (@38) for asking that question. It’s a natural one for understanding how these 100- and 500- and 1000-year flood estimates are derived and one I’ve asked myself quite a few times but gone no further with it. And thanks Hank Roberts, that helps some too. Notice it says: “The estimates of the flood quantiles are calculated using actual data collected at a site.” I just went looking for the number of sites the USGS has for measuring peak water flow and found that “There are 29,218 sites with peak streamflow data.” That’s a lot and, of course, any river will have multiple sites contributing data for which these flood quantiles are calculated. There are, of course, lots of ways the USGS might use all that site data for identifying the area being considered for this flood return-period estimate. Over at RealClimate someone has asked: “Is a 1000 year storm based on a town, a county, a state, a nation, a set number of square kilometers, or what?” And another person responded by giving your answer to a FAQ, saying in part that “The estimates of the flood quantiles are calculated using actual data collected at a site.” So my question is: With multiple sites on rivers that presumably would show varying increases in flow rates from storms, how do you, well, arrive at the combined area for which your flood return-period estimate applies? Thanks in advance and I apologize if this is discussed elsewhere and I simply didn’t search enough. It’s a question I’ve had for some time and so I was interested in this. I can probably handle the technical, quantitative aspects of this derivation from my quantitative/statistical background. I don’t find it in the given reference of his paper, can someone help? A thread on the Storm2K forum contains several quotes from Ryan Maue regarding historical storms which are very likely underestimated in intensity. 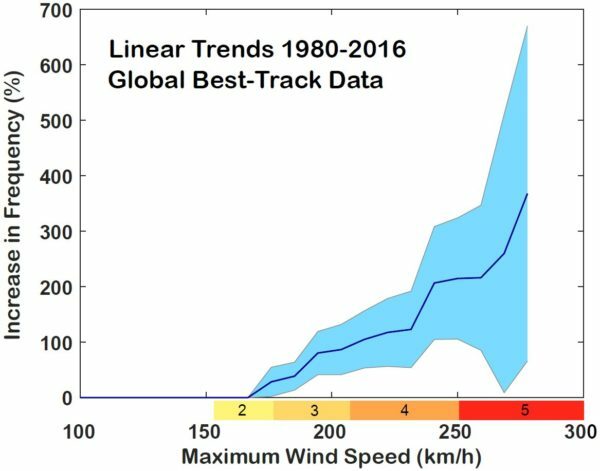 Care is required when trying to tease out trends in tropical cyclone intensity from limited records which are inhomogeneous.